Blackboys is a small village in East Sussex. There are several explanations as to the provenance of the name, but the most likely explanation is the meaning 'black wood', so called due to the soot being deposited in the woods from the charcoal burners that were prevalent in the area. The charcoal was probably used to fuel the nearby Buxted foundry, where it is believed the first iron cannon was produced in 1543. Early in the 1800's the main iron producing area moved to the Midlands. The Blackboys Inn was founded in the 1300's, possibly as a resting point for the drivers moving charcoal, and is still going strong today. 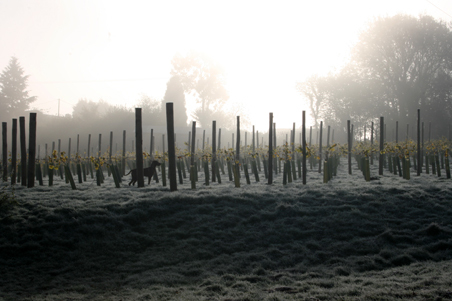 Realising the opportunity that exists to make a high quality sparkling wine here in the South East, I returned to higher education to study viticulture at Plumpton College and set out to find a home with land. We found our perfect site a year after leaving Plumpton and planted 2 hectares (45% Chardonnay, 45% Pinot Noir and 10% Pinot Meunier) in May 2007. 17 different combinations of varietal, clone and rootstock are planted, each of which were carefully researched in an attempt to bring the required complexity to our wines from a comparatively small scale planting. The old adage says 'small and perfectly formed' - our vineyard’s size and location means we can personally carry out all the work. For us, this was crucial in order to be totally in control of the development of the vines. With Blackboys Vineyard being a 24/7 family run operation, it allows us the attention to detail which impacts directly on the high quality and personal finished product. The 2011 harvest saw us pressing in our own winery for the first time. It is a very exciting time for us, finally bringing the whole cycle from pruning through to putting the label on a finished bottle totally under our own control.